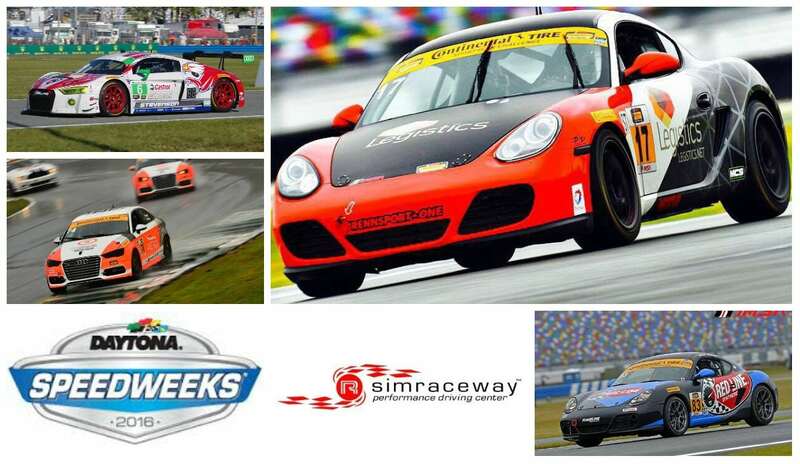 Simraceway Drivers at Daytona Speedweeks 2016! 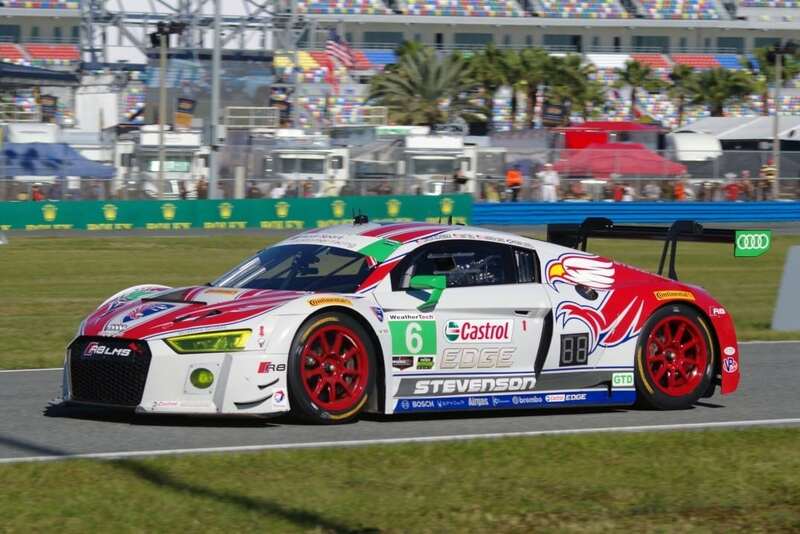 The end of January heralds the start of the professional racing year as Daytona Speedweeks kicked off with the IMSA Continental Tire Challenge and the Daytona 24 hours. Simraceway Alumni and instructors were well represented and achieved some fantastic results as well as some heartbreaking moments but that, as they say in the biz, is motor racing. Fresh off the plane we gathered together some notes from the drivers about their first races of the season. For me, the event signaled the first time I would be racing closely with Audi Sport, a brand with which I’ve been involved with and a fan of for a very long time. I have worked at the Audi sportscar experience in Sonoma since 2008, my personal car is an Audi, my parents’ personal cars are Audis, and my earliest memory of a sound I truly fell in love with was the bark of an Audi 5-cylinder. I am a huge fan of the company, and I consider it a great honor to be finally working with them at the race track. The new R8 LMS is fantastic. The 2016 Balance of Performance adjustment was such that the R8 LMS was between 7 and 12mph slower than the Lamborghini. A similar deficit was experienced on the oval to the Porsche and Ferrari. We were very good on the infield, despite having very little actual dry practice time to tune and tweak the car, but it was not going to get us within 2 seconds per lap of the fastest cars in our class. With some good strategic calls and lightning quick pit stops, we were briefly leading our class, averaging out top-10 for most of the race through the night. With the exception of a blown tire up against the wall exiting NASCAR Turn 2 — which is exactly as scary as it sounds, by the way — we were inch perfect in operation. By early morning, however, the field had caught up. The Silver-rated drivers had their required time completed and the now pro-driven GTD cars really started to show what they could do. Our consistency was no longer our advantage. The left-right punch that really worked us down the score board was the combination of a left rear wheel that had welded itself to the hub and an impact with the leading prototype car in Turn 5 on the right rear. This sent me back to the garage and the fix involved most of the Audi Sport Customer Racing employees and nearly our entire team. It was the single most impressive thing I have seen done in a Daytona garage. The left rear was being cut off using a Sawzall, the two front brakes were being replaced, and the right rear suspension damage was being mended. The whole job was done in under 10 minutes, and it involved some of the best inter-teamwork I’ve ever experienced. One of the real stars of the show, in my opinion, was one of our German techs, Philip Riedel. He is a bear of a man, and he went “Hulk Smash” on the task of working on all four corners of our Audi. From throwing two halves of a severed wheel the length of the garage, the bare hand spreading of brake calipers, to the lifting and relocating of an armored golf cart, he was truly a key player in getting our car fixed and back on track. “I had a fun weekend getting to know the car. Qualifying was tough for me in a new car in the wet. Basically the first dry laps I drove in that car was when I took the green flag. Half way through my stint I started developing a great relationship with her and was feeling comfortable. I worked my way from starting 14th to running 6th. We had a perfect driver change when we pit halfway through during the caution. We were held up waiting on fuel to finish, not knowing if it was full as the fill light was broken. Spencer Pumpelly (teammate) drove a great last half and pushed toward the front”. 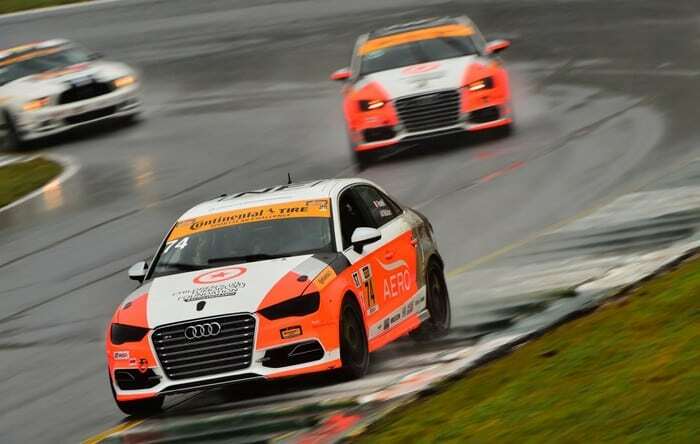 Simraceways F3 Chief Instructor driving with our F3 series driver and Turn 1 Club member Jim McGuire in the Aero Paint Audi S3 Quattro #74 for Compass 360 racing. 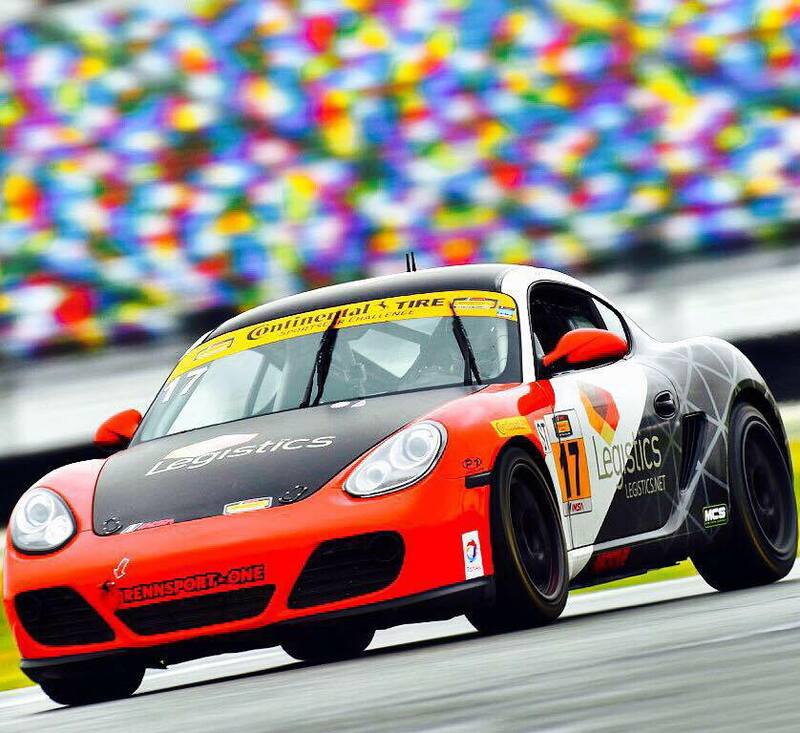 “This year, in Daytona, the weather was a pleasant surprise for us. It rained for every session leading into the race, but unfortunately, the race itself was completely dry and all of our speed dried out! We have the dominant car in the wet, but although we have improved quite a bit from last year, we are still lagging a bit in the dry. 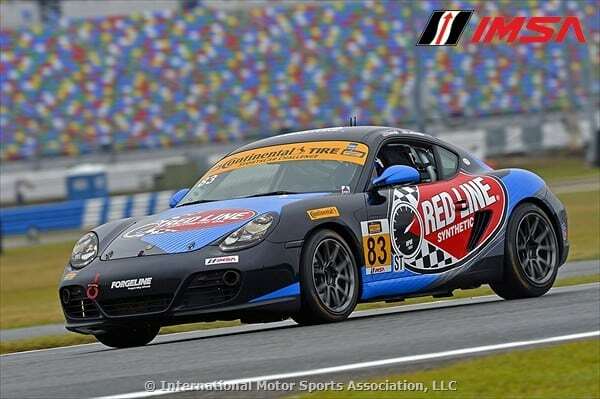 Jim did a brilliant job and qualified 3rd for the first Continental Challenge rain qualifying ever. Unfortunately, almost right after the start, the transmission developed a problem and it seems like our clutch started to slip, oddly enough only in the left hand corners. Jim had a hard time to cope with it at first and dropped pretty fast into the rankings. After I got in the car, I had more pace but it was really hard to try to manage that clutch slippage, yet keep pushing hard. Eventually, and unrelated, it seems like we lost a coolant hose and the engine went up in smoke. I hope that I have saved it by stopping as quickly as I could do safely, but we will see. “It was great to be back in the #83 Red Line Oil / Next Level European. Daytona has always been good to me over the years with 4 podiums and 2 top 5’s in the last 6 years, and the trend was kept intact this year as well. We ended 5th after a customary Daytona drafting fight all the way to the checkered flag. It’s always great to race at that track as each and every corner is a passing zone which makes it one of the most fun on the calendar.